I am a crochet pattern designer. My goal is to provide fun, adorable crochet patterns that are easy to read and enjoyable. My children are the inspiration of my creations. I hope that you enjoy my designs as much as I do, and maybe even as much as my kiddos do! I am excited to announce that I have had the pleasure of becoming a designer for Leisure Arts publications. I am the designer of the Leisure Arts book # 6188 Learn to Crochet Toys. Hello and welcome! 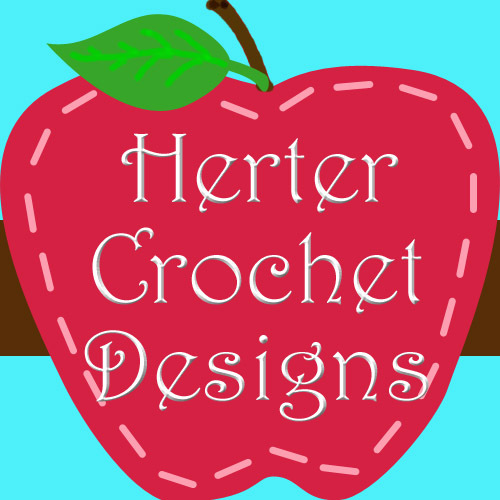 I am a crochet designer and I design and sell my original crochet patterns. You can check out my patterns in my ravelry store here: http://www.ravelry.com/stores/herter-crochet-designs I have patterns for sale, and I also have one free amigurumi pattern as well. I also have started adding my patterns to the crochetville pattern store. You can access the patterns I have available here by visiting my profile and clicking the "files" link on the side. I see what you are talking about, and really it would probably be ok to leave it that way. Since you already tried chaining 3 instead of 5 (and it didn't look quit right) maybe try compromising and chaining 4. If that still doesn't give you a flat circle, do the chain 5 as the pattern suggests. If you are still unhappy with the holes, you could always try to make a cute appliqué to sew over the center after the blanket is finished. Perhaps a teddy bear face, or an animal face, or maybe even a star would look cute in the center of the blanket. Good luck with your blanket! Yup, I agree with making a swatch first. For a blanket, I would not just chain a number of stitches without knowing how big it was going to be first. It's a lot of yarn and time invested in a blanket, so you want it to come out perfect. First make a swatch, and then sues the swatch to see how large the ripples are, AND to figure out how many stitches per pattern repeat (basically figure out that ratio that they left off in the beginning.) After you have your numbers, figure out how many pattern repeats to get the length you want, and then chain the number of stitches accordingly. Oh, I read your blog post when you posted it on the Leisure Arts Blog. You did a great job on the blanket, and a great job on the post. Ah yes, i don't like color changes either... only because then I have all those pesky ends to weave in. I like weaving my ends in toys much more. It's so easy to just pull the yarn through the center of the body and be done with it. Hi Stella, First, welcome to Crochetville! I will explain what I like to do when I don't want my sewing stitches to show through on the other side. First, place and pin the flower where you want it on the afghan. Next, using a long tail of yarn and your yarn needle, begin sewing the flower to the afghan by stitching through the center of the posts of the stitches on the afghan (rather than sewing all the way through the fabric). As you sew, start from the center of the flower and sew in a circle. If you still feel you to secure the flower more, keep sewing in a spiral until the flower is completely secure. I hope this helps, and is not too confusing of an explanation! Those are cute! I especially love the candy corn hat! That is a work of art, I bet all of the kids will want one! Very sweet. What a cute idea! I love your soap covers.